On a scrapbooking site where I am on the Creative Team, I put out a challenge called, "12 on the 12th". I heard about this challenge on Scrapbook Memories, a TV show from Brigham Young University TV. The challenge is to take your camera everywhere with you on the 12th of each month, take 12 photos to scrap. They should be photos of your everyday activities on that day. Maybe you will be lucky enough to be going to a wedding and dressing all up, or maybe you will have to take your camera to work, or with you as you scrub floors...whatever. 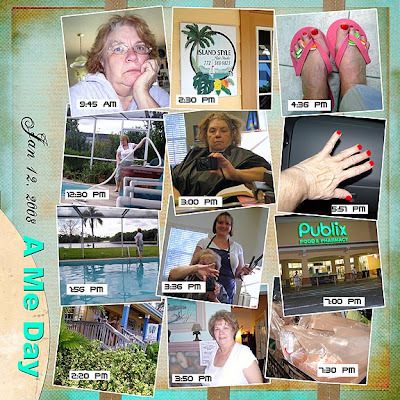 Here is my embarrassing day on January 12. I can hardly wait to see what February 12 brings. 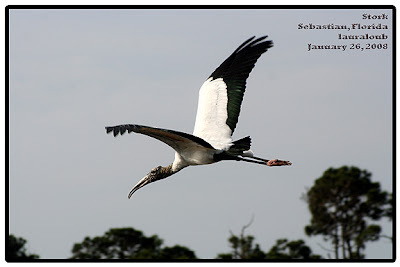 There I was talking to the stork today when he decided I had moved close enough and he took off. I was fast enough this time to get the above shot. Oh, he was back in an hour or so. There is a stack of cans of sardines in the cupboard so I opened one of those and put them out in the grass for him. He kept eating one, then snapping that big beak...as if smacking his lips. I am not about to feed him by hand with that beak! A POSTSCRIPT: I sent this photo in to the Scripps newspaper for our area and it was published in the Photos by our Readers column. I really think this is the same fellow we have seen in other years. In fact, my first photo with the Canon Digital Rebel, last February, was of him. He has a route all around our lake begging from the soft-hearted ladies. He comes right up to the screening of our pool and peeks into the doorwall. If it weren't for the screenhouse, I am sure he would peck on the door. When I go out the screen door at the side he prances right around to greet me. He eats about anything, but prefers canned tuna. When I am finished he will follow me until he is SURE there won't be any more treats. He knows a "mark" when he finds one. I couldn't resist taking a photo of this pair of Osprey this noon. The island where they roost is to the west of us and evening is usually when they roost. By their roosting at noon, today, the sun gave me a better view of their white markings, instead of just an evening silhouette. We saw an alligator this noon. It was right in front of the house and moved around very slowly. Finally I got the camera on a tripod and went out to the seawall with it. At one point I could see his whole body through the water and I estimated it at 4 feet nose to tip of the tail. About then he turned toward me and looked right at me. This is not the first time an alligator in the lake has met me eye-to-eye and it is quite an experience. There is no fear and you can't really read curiosity in the eyes...just cold measuring of the prey, or no prey. We have seen no sign of the 14 footer from last year. The den and beach across the bay where he spent the winter is well under water. We figure the water level in the lake is up about 6 inches over last year and covers the little "beaches" that developed along the shore lines. The long-legged water birds still wander in the shallows, but other birds that congregated on the sand, now are on the lawns in the evenings. The bench where we would sit almost every evening succumbed to the heat of last summer and the metal broke into several pieces. The guys bought another bench and put it in place, so we are back by the water's edge each evening with binoculars and camera (and a couple of beers). We arrived in Florida again on the 10th. Of course, in my head I had told myself that, after 5 years, nothing would be new. 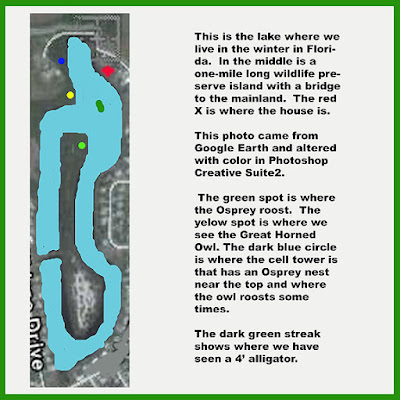 We have seen all of the birds and animals we are going to see, especially after the family of Sandhill Cranes last year. "OH," said our neighbor, "We have an owl. Up there in the tree. Hear it?" Well, I certainly could hear the soft "Hoo Hoo". Tonight I was looking across the bay at a large bird in a tree branch that sticks up way above the rest of the trees. Through binoculars I could clearly see the "horns" of feathers that screams, Great-Horned Owl. I watched for a moment then a noise sent the owl to the cell-phone tower. It is half a mile away but I dragged out the camera and tripod and tried, in the twilight, to get a photo. I have the rest of the 4 months to try and get better photos but, for what they are worth, here is the best shot. The Great Horned Owl will take large prey, even other raptorial birds. It regularly kills and eats other owls, and is an important predator on nestling Ospreys. The reintroduction of Peregrine Falcons has been hampered in some areas by owls killing both adult and nestling falcons. The Great Horned Owl is a regular victim of harassment from flocks of American Crows. Crows congregate from long distances to mob owls, and may continue yelling at them for hours. The enmity of the crows is well earned, however, as the owl is probably the most important predator on adult crows and nestlings. Even though the female Great Horned Owl is larger than her mate, the male has a deeper voice. Pairs often call together, with audible differences in pitch.